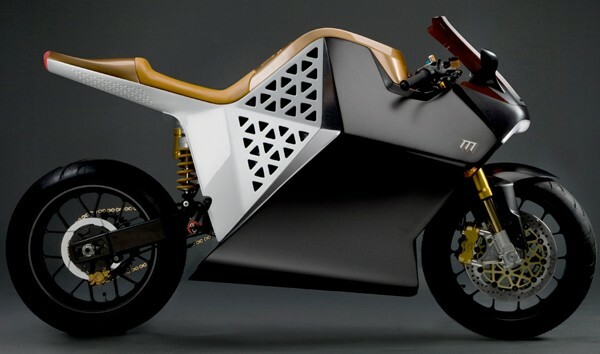 29 december 2010: Mission Motors unveiled the Mission R, the company’s new electric racing superbike. 11 februari 2009: Zo, dat noemen ze nou een echt racemonster. De Mission One werd onlangs gepresenteerd tijdens de jaarlijkse TED Conferentie en gaat debuteren tijdens de TTXGP op 12 juni 2009. Mission Motors unveiled the Mission R, the company’s new electric racing superbike. Featuring the company’s latest powertrain technology and an entirely new race-ready design, the motorcycle will lead the company’s upcoming 2011 racing program including the TTXGP. The Mission R features the latest components from MissionEVT, the EV powertrain technology arm of Mission Motors. MissionEVT components are powerful, intelligent, and efficient. The Mission R packs 14.4 kWh and 141 horsepower in a package smaller than a modern 600cc sportbike. The liquid-cooled 3-phase AC Induction motor creates 115 ft-lbs of torque at the crank from 0 to 6400 RPM, propelling the Mission R to a top speed of over 160mph in a single gear. The MissionEVT 100kW motor controller, with customizable regenerative braking maps and throttle maps, allows the rider to tune the bike to his or her preferences. The Mission R chassis, designed by James Parker, features an entirely new design for integrating and balancing the weight and volume of a large EV battery pack into a motorcycle chassis. The chassis is wrapped in a new and aerodynamic industrial design by Tim Prentice of Motonium, with a small frontal-area and aggressive ergonomics.